It’s a big weekend for road racing. On Sunday, there’s the SHAPE Women’s Half Marathon in Central Park. But on Monday, there’s another pretty famous race taking place. Perhaps you might know of it. It’s an Abbott World Marathon Majors race. The route starts in Hopkinton, MA, and finishes on Boylston Street. It’s got thrills, spills, and plenty of hills. It’s none other than the Boston Marathon. 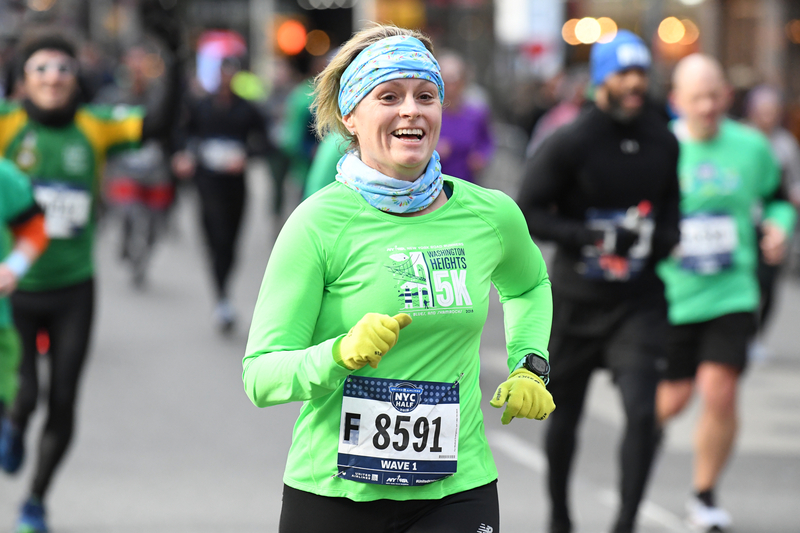 While NYRR staffers work away at headquarters on Monday, April 15, some lucky and accomplished members of our team will toe the line in Hopkinton, ready to embark on a 26.2-mile journey. We spoke to some of them before they "shipped up to Boston." 1. Which race did you run to qualify for the 2019 Boston Marathon? For the 2019 race, I ran the 2018 Boston Marathon, but to get into the 2018 race, I ran the 2016 Brooklyn Marathon in 2:39:24. 2. 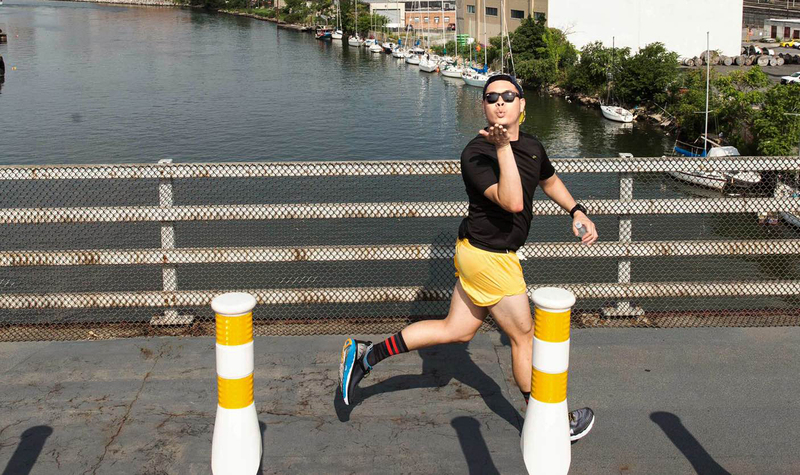 Have you run the Boston Marathon before? Just once, but I’ve gone to Boston to watch the race almost every year since 2007 (just missed the 2012 edition). 3. 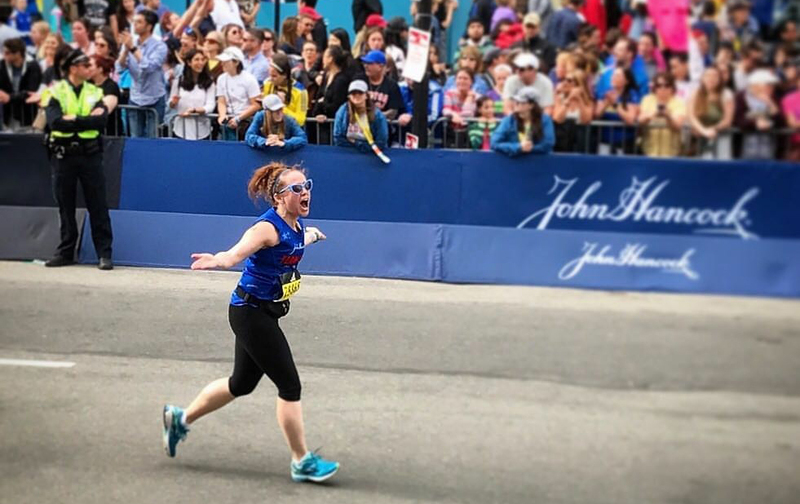 What’s your favorite memory from the Boston Marathon? It’s either getting to the top of Heartbreak Hill and seeing Boston College (go Eagles, class of 2011 right here), when I knew the “toughest” parts were over, or making that final turn onto Boylston Street and knowing I was going to finish it. 4. Toughest part of the course? The downhill going from Wellesley into Newton (mile 16) was my darkest point. My legs felt pretty beat up by that point, and I started to doubt if I’d finish, but once I got to 17, I knew where I was and what to expect from there. 5. What are you most looking forward to at this year’s race? Better weather, hopefully! But if not that, another chance to run the course now that I know what to expect. 6. Which is harder, training to qualify for Boston or training for Boston itself? I qualified initially by running a fall marathon, so this just opens up that question of which is better: Spring or fall? And I still don’t have an answer for that. 7. Best piece of advice someone gave you before running Boston? One of my college coaches—who had run 2:11 on the course—just told me to stay patient, so I tried to keep an even effort, especially early on. You end up sort of yo-yoing back and forth with different runners in your pack, so you have to keep reminding yourself to run your own race. 8. Weather: Can it be worse than last year? You can always put more layers on in the cold, so I’ll still take that over a heat wave. Having said that, I’ve found myself mostly avoiding running in the rain ever since Boston 2018. 9. Post-race meal/beverage you are looking forward to? Ideally, it’d be a sandwich from Moogy’s or a burrito from El Pelón (both in Brighton), but I’m not sure I’ll be able to get out there. 1. Which race did you run to qualify for the the 2019 Boston Marathon? Yes, this will be my 12th consecutive Boston Marathon. The 2014 race, which took place a year after the terror attack at the marathon. It was the most emotional, gratifying, and unifying day that brought people together. Before: The preparation. You have to run during the cold winter, which makes training for a spring marathon difficult. During: The Newton Hills. People don’t realize that it is a constant up and down course, it’s like a fishbowl. Better weather than last year, which is wishful thinking. Trying to qualify for Boston, especially with the new time qualifying standards. Do a long run on the course. It’s always great to see the course before race day. Also, run your race. The majority of runners on course have qualified, so you’re running with experienced runners. Enjoy the day and just have fun, because you earned it. Now I am shaking! Weather is weather and you just can’t foresee New England weather. Last year, many of us were ready for a sprinkle of rain and dressed for that. Many sub-elites were in singlets and shorts. Most of us will be now prepared to bring a running jacket, no matter what the weather is like this year. We got the three combined things that no one wants: Torrential downpour of rain, which was cold and bone chilling; wind at your face; and the rain was on and off. You would warm up, then your body would go cold, and then the cycle would repeat itself over and over. It was a rollercoaster for the body temperature. Chocolate milk or the 26.2 beer. Bobby Asher and Cassie Wangsness at NYRR Club Night. Toed the line eight times, finished seven of them. Beating Lance Armstrong in my first Boston Marathon in 2008 and recording a seven-minute PR. 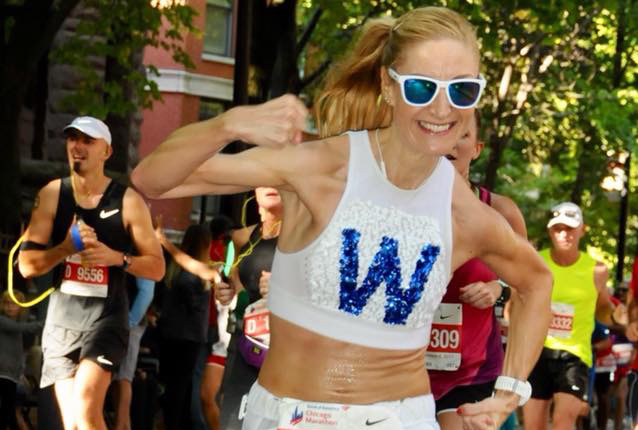 Running with Cassie Wangsness and enjoying the experience without racing. Sure. Some people recorded PRs last year. I think 110 degrees would be worse. 3. What are you most looking forward to? I'm looking forward to everything. I can't wait pick up bib number 18270, to lay out my race clothes, and to experience the full range pre-race emotions. I can't wait to wake up on Monday morning with that feeling of mixed excitement and fear, and to do my best to stick to my race plan. I can't wait to run with Bobby Asher, who will generously be running with me instead of racing himself. I can't wait to see so many incredible, supportive people along the course, and to finally have that medal draped around my neck. And the first post-race beer. I can't wait for that, either! 4. Describe your Boston Marathon journey in five words or less. Training to qualify was harder. Although I've physically trained harder for Boston than I did for my qualifying race, previous training cycles always had a stronger sense of doubt that I was always fighting. 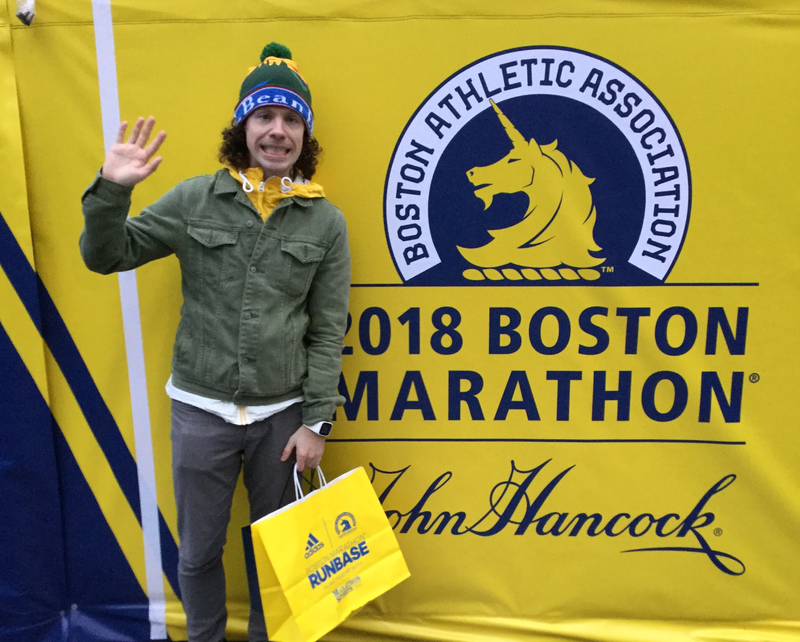 I felt stronger training for Boston than I did for previous marathons, and think a lot of that had to do with the confidence I gained in qualifying. Stick to your plan and enjoy the experience. Heat will always be worse for me than cold, windy, and rainy conditions. I always lean toward a tasty IPA and most likely a burger after a race. The 2017 Hartford Marathon (3:42:50). No—but I did qualify once before (after running the 2014 Chicago Marathon in 3:43:04), only to miss out on the 2016 race as it wasn’t enough. I am a proud Wellesley alum, so I’m super psyched for the scream tunnel. I rowed in college, and I often ran miles 12-16 in between practices. We trained on the Charles River in Boston, so I have also driven that section of the course thousands of times. Hard work, frustration, perseverance, TRIUMPH! Running a marathon without a monkey on my back. I’ve trained really well, including going up to Boston to do my final long run on the course, so I’m excited to pour all that fitness onto those hills. For me, definitely training to qualify. I had to run seven marathons (actually 7.5 as I dropped out of one on a hot day) to get here. That’s 197.4 miles. If you travel from New York to Boston, it's just a little more than that number, so that just shows you. Boston veterans such as Stuart Calderwood, Brian Hsia, Bobby Asher, and Ann Restak all told me I should finish my long runs in the Harlem Hills. And now that I’ve seen Heartbreak Hill, I’m glad I followed their advice. It’s not that bad, it’s just in a really bad place. I stood at the corner of Commonwealth Avenue and Hereford for about six hours last year, so I’m pretty confident that no, the weather could not possibly be worse. If it’s warm, I will happily slow down and high-five every little kid between Hopkinton and Copley Square. A Beefeater martini (very dry, straight up, with a twist) and a cheeseburger (cheddar, medium rare, lots of pickles). 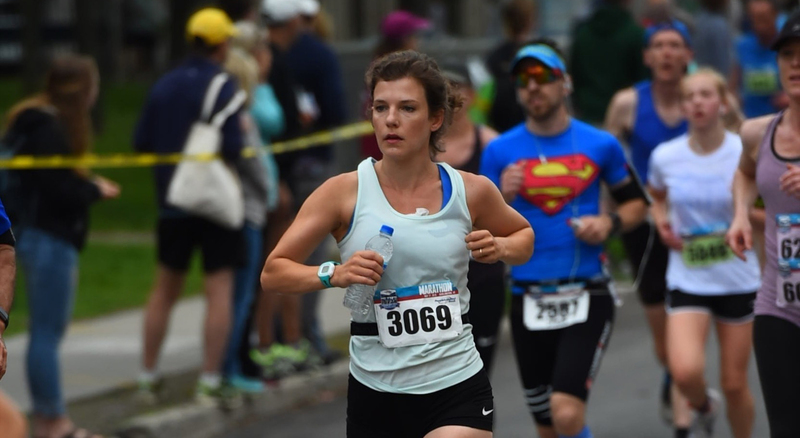 The 2018 Vermont City Marathon. No, but I did qualify for the 2017 race. However, two days after I got my acceptance, I found out I was pregnant with my second child, so I decided that running Boston at about 8 months pregnant wasn’t my thing. So I worked to BQ all over again. I always thought of myself as just an average runner so qualifying for Boston still kind of feels like a dream come true. I can’t wait to finally run this historic race. I am going to soak every moment in. The course, and the hills of Newton. Everyone talks about them, so I can’t wait for the challenge. Why not embrace them? Isn’t that why there is a unicorn on the medal? Both. Every training cycle is different, but the times I qualified for Boston, I was just less than a year postpartum. So not exactly ideal conditions, but a lesson that good things can come from not putting too much pressure on yourself, control what you know, and trust yourself. While the training for Boston was as hard as any other training cycle, I am more excited than ever before to finally run it. Probably. I’ll plan for the worst, hope for the best. I’m curious about the 26.2 beer! I didn’t qualify. I run for Team Hoyt and raised money that will be used to enrich the lives of differently abled people and to support inclusion in endurance sports. I have spectated at Boston each year from when I was one year old until I started running in 2013. I have now run six consecutive Boston Marathons. My favorite memory from the Boston Marathon is catching up to, and then finishing alongside, my beloved Team Hoyt in 2014. Turning right at mile 17 and knowing that you’re going into four miles of hills. I always make sure I scream “Let’s go run some hills” and it usually makes someone laugh. Then I feel better about the work ahead. This year, I’m so excited and honored to be sharing the road with so many of our NYRR Group Training coaches and runners. I’m so thankful for all the awesome spectators from NYRR that travel to cheer for us. Honestly I don’t see qualifying for Boston in my near future. However, raising such a large amount of money for charity takes a lot of commitment, especially many years in a row. But Boston is my hometown race and I wouldn’t want to be anywhere else. Don’t scream we’re running Boston as you cross the starting line and then run too fast for four miles of downhills. I can honestly say any day you get to run Boston is a great day. The weather is a part of that story and it’s all going to be OK.
A burger from the bar at The Sheraton and a cannoli from Mike’s. 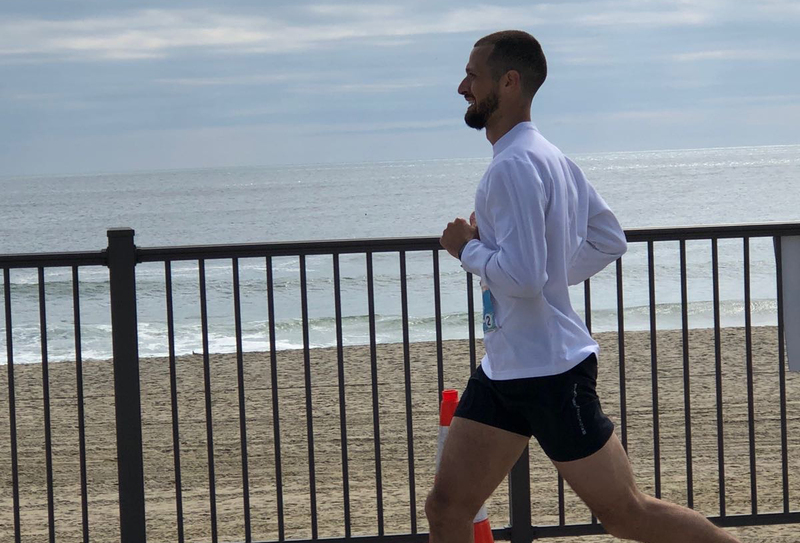 The 2018 New Jersey Marathon. Heartbreak Hill (I love challenges). The atmosphere in the start village. Training to qualify because I had to learn to believe in myself. Only if conditions were similar to that of the North Pole marathon. Burger, fries, and a big beer. I’m running with Equinox, a marathon sponsor. The energy along the historic streets of Boston. 4. Describe your Boston Marathon journey in five words or less? Quick, efficient, teamwork, gracious, excitement. 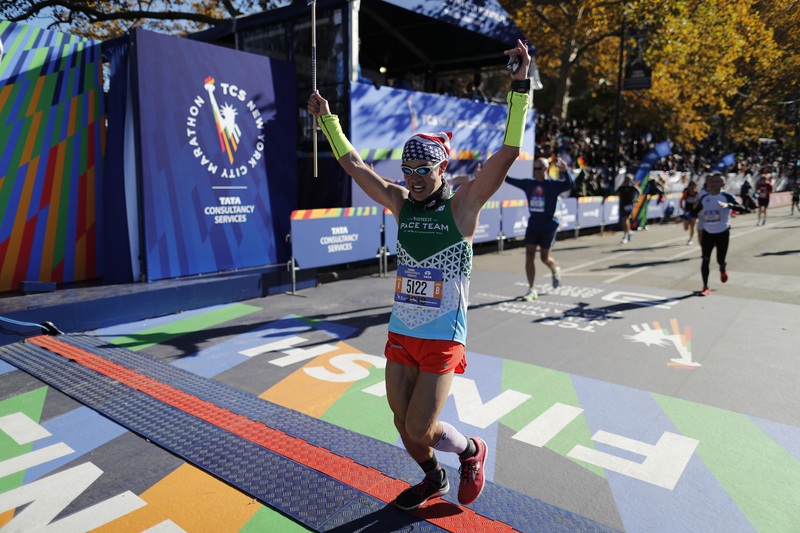 Crossing that finish line with the biggest smile ever. We run in all conditions. We’re prepared for anything. All the doughnuts in Boston. Yes, this will be number three. The sunny one in 2017. The course was lined with friends and family. Some snuck up from Brooklyn bearing signs. My brother Jim flew in from Chicago and, of course, there were the always-perfect strangers (many inebriated) every single mile. Everything: I love everything about it. Why split hairs? They’re both hard” and that’s how it should be. Workouts are dirty root vegetables; races are the dessert. Guess what? You only get one first Boston. Enjoy it. Stop when you see your friends and family, who, one way or another, all helped you get there so stop and hug them. Kiss the Wellesley women (if they ask) and thank the volunteers. And if you see a runner by the side of the road, help. You can always spend the rest of your life parsing minutes and seconds, this is one you soak up. Yes, it could be hot and there are zero hacks for hot. Easy. The salted rim of a sink-sized margarita, followed promptly by a rest.